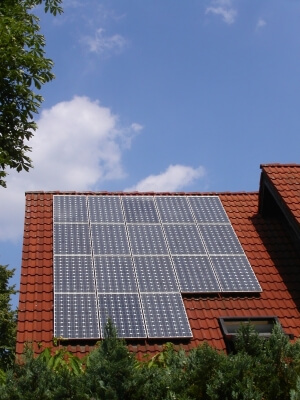 Why choose a clean energy supplier in Maryland? Maryland’s electricity comes from a diverse mix of technologies, but renewable energy still plays only a very small part in the state’s generation portfolio, with the bulk of the power coming from ‘conventional’, dirtier sources like coal and nuclear. Many Maryland residents, even if they are concerned about the environmental impact that their electricity use is having, may feel like there is nothing they can do to change the situation. Making the switch to a clean energy supplier in Maryland, however, is a lot easier than most people realize. This article takes a look at Maryland’s current electricity mix and talks about how electricity customers can support renewables in the state by joining up with Community Energy. Maryland’s electricity: Where does it come from? Unprecedented growth in renewable energy generation is currently taking place across the USA, with wind & solar technology more affordable than ever and more and more states implementing renewable energy incentive programs. Maryland is one of the states that has just begun to transition towards a cleaner energy mix, having set for itself a renewable energy target of 20% by 2020. Nevertheless, only a small portion of the state’s electricity currently comes from renewables. As the chart to the left (data via EIA) indicates, even as recently as 2012 the vast majority of the state’s electricity came from coal and nuclear (42% and 35%, respectively). Only about 8% came from renewable sources (mainly hydropower and biomass), with wind and solar contributing less than 1% of the total electricity generated for the year. Coal, as we have pointed out previously in an article about Pennsylvania’s CO2-intensive electricity generation, is the dirtiest yet most common fuel for electricity production in the nation. The environmental impacts of coal-fired power plants go beyond those related to climate change; their pollution also affect human and ecosystem health. All of this is in addition to the impacts associated with its mining and extraction. 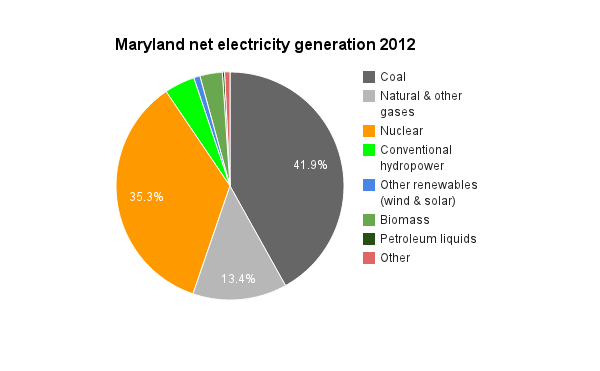 Maryland also makes heavy use of nuclear power and natural gas in its electricity production. Both of these, although less carbon-intensive than coal, have their issues. The primary problem with nuclear as a ‘sustainable’ energy source is the disposal of its waste products, which remain radioactive for tens of thousands of years. Shale gas/natural gas, as we have written previously, is also problematic for a number of reasons–including methane leakage from wells during extraction. Maryland residents who care about the impact that their electricity use has on the environment can ‘vote with their dollar’ and switch to a renewable energy provider instead of a standard utility. With the support of ordinary citizens who make the conscious choice to switch to renewables, Community Energy has been developing clean energy projects across the northeast US for well over a decade. With customer support, for example, Community Energy was able to launch New Jersey’s first wind farm–the Jersey-Atlantic Wind Farm, among numerous other large-scale wind and solar projects.